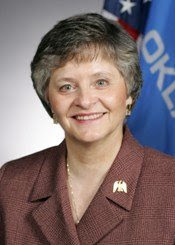 From the Victory Fund, an audio clip of an Oklahoma state representative saying what she really feels about gays. The Victory Fund doesn't want to name the legislator lest she become a "cause célèbre" for the right wing. UPDATE: OK, now that Sally Kerns' identity is known, here's her mug. Wanna contact her? Capitol Address: 2300 N. Lincoln Blvd. Room 332 Oklahoma City, OK 73105 (405) 557-7348. District Address: 2713 Sterling Ave., Oklahoma City, OK 73127.